Straight teeth in about a year! You don’t have to miss work to get your teeth cleaned! With our convenient location in Pleasanton, CA, we are just a short drive from the surrounding areas of the entire Tri-Valley area. Dublin, Livermore, San Ramon, Danville, Alamo, Walnut Creek, San Leandro, San Lorenzo, Hayward, Oakland, Castro Valley, Tracy, Lathrop, and Manteca are all close to our beautiful office in Pleasanton. Pacific Dental Care is your local, family-friendly dental office, able to manage everything from your children’s cleaning and exams to implant dentistry and full-mouth reconstruction. We offer the GentleWave® endodontic (root canal) system, VELscope® Vx oral cancer detection, Invisalign, CEREC® same-day restorations, The Chao Pinhole Gum Rejuvenation Technique, hard and soft tissue laser dentistry, and we are Senior Master Providers for Fastbraces®. 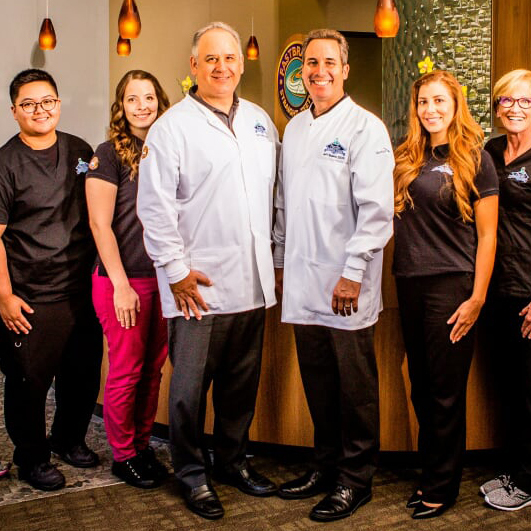 Dr. Bueno, Dr. Sellick, and the Pacific Dental Care team are committed to providing the highest quality clinical care and personalized service in a warm and compassionate atmosphere. We enjoy getting to know our patients and strive to foster relationships that last a lifetime. We customize each treatment plan to reflect the individual needs of each patient, and each patient is treated with respect and consideration. Our team provides quality dental care, conveniently in your neighborhood and we do our best to cater to your schedule. We offer early morning, evening, and Saturday appointments so you won’t need to miss work or school for routine cleanings and examinations. Because your comfort is important to us, we offer many of the modern amenities you’ve come to expect in a dental office. We believe that whatever your dental needs may be, you will be treated with the highest quality dentistry available and with the most compassionate, respectful care you deserve. Dr. Bueno and Dr. Sellick are Master Affiliate Providers of Fastbraces®to their family of patients. Your children deserve broad beautiful smiles! Why would anyone want to be in braces longer than necessary. Fastbraces® is fast, safe, easy, and because treatments take less time, treatment is more affordable. Often times, the cost of Fastbraces® is just 1/2 that of traditional braces.